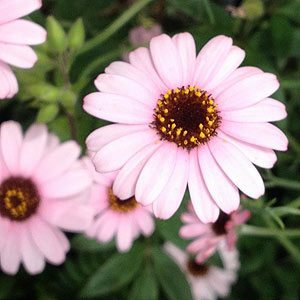 A lovely ornamental plant with deeply cut silver grey foliage and pretty daisy like flowers Rhodanthemum gayanum is an excellent plant for containers or the garden border. Flowers range from white to deeper pink depending on cultivar, usually with a deeper centre. Evergreen and needing little care except for a light pruning in spring to maintain shape and a general tidy up at the end of the season in autumn. Reaching around 25 – 35 cm in height (depending on cultivar) and a spread of around 35 cm this is a wonderful long flowering plant that with a little water and a slow release fertiliser is a good performer. Some pretty dwarf varieties are now available. Grows well in full sun in a humus rich well drained soil is best, keep moist in summer but do not over water.